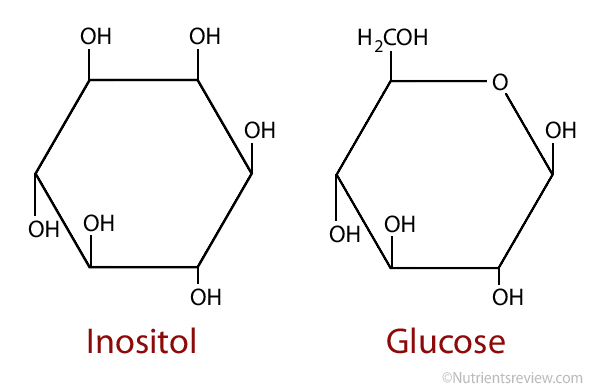 Inositol is a nonessential nutrient, a carbohydrate or, more specifically, a sugar alcohol that can be produced in your body from glucose, so you do not need to get it from foods in order to be healthy [1,10]. Two most common naturally occurring forms of inositol are myo-inositol and D-chiro-inositol. Inositol helps to build cell membranes . Myo-inositol acts as a secondary messenger in the nervous system; it increases the effect of neurotransmitters . D-chiro-inositol and myo-inositol increase the insulin sensitivity. In one study, individuals with diabetes 2 (non-insulin dependent diabetes) had lower excretion of D-chiro inositol in the urine and lower D-chiro inositol content in muscles than healthy people . Inositol is POSSIBLY INEFFECTIVE [5,7] in the prevention or treatment of Alzheimer’s disease, autism, nerve damage (neuropathy) in diabetes  and schizophrenia. There is INSUFFICIENT EVIDENCE  about the effectiveness of inositol in the prevention or treatment of anxiety, attention deficit-hyperactivity disorder (ADHD) , binge eating and bulimia nervosa , cancer, depression , high cholesterol, insomnia, obsessive-compulsive disorder (OCD) [5,7,24,25], panic disorder [5,7,24,26], premenstrual dysphoric disorder (PMDD) [8,23] and Raynaud’s syndrome  or in promoting hair growth. Inositol is POSSIBLY SAFE for most adults, and for treatment of infants with acute respiratory distress syndrome . Side effects may include nausea, tiredness, headache and dizziness . Not enough is known about the safety of inositol supplements during pregnancy and breastfeeding, so women in these periods should avoid them. There are no known inositol-drug interactions .